It is known that Aries is the first in the list of Zodiac hierarchy. Therefore, there is no surprise that Aries dog is the leader and it would make no compromises about that. This canine is "first" anywhere and this is undisputable. It desires to get involved in all sorts of challenge. These dogs are fast, quick-tempered and undergo extremes. They ought to be the leaders of the pack. Such animals are very strong, energetic, dynamic and seem to never get tired. Having such a dog, get prepared for long walks. Don't hope that everything would end in one turn. Your pet would ask you to repeat your walk for several times. Your pet would like to undertake many kinds of activity and all of them would be quite different. These dogs are very curious and brave. Consequently, you should not be surprised that they will be involved in dangerous matters. They are commonly involved in different accidents and you have to keep any eye upon them, for they may get hurt. One of the greatest and most frequent problems of such dogs are headaches. They easily get sunstrokes and so on. Mark that such kind of dogs requires much space at home and you should not limit their movement. Under condition, your apartment is lacking space for these dynamic dogs you would quickly get tired. Consider this essential point prior to buying Aries dogs. Accordingly, it would be wise to secure your pets with the required place to give away their energy. Do not try to put them in cage. Fences and gates would not stop such unstoppable dogs. When it comes to the issue of freedom, this sort of dogs would become utterly inventive and clever. They would put to use all their knowledge and would use any possibility to get out. They would quickly escape. It would be utterly difficult to make this dog do what you wish. Even months of hard and serious trainings would not make it change its mind. It becomes a fighter for its rights and independency right from the early-early years of life. You would hardly win great battle, because it is another challenge for such a dog that adores them. Almost in all occasions, the end would be within the compromise from one of the parts. And guess what! The owner would be that part, which would give up and undergo compromise. Nevertheless, such a dog is kind and amusing. It would bring you a lot of fun and pleasure. It is quick to forgive and forget abuses. In case, there is another or a few other pets in the house, they would be led by Aries dog. With the strength and power of its will, the dog would become the commander of the others. None would withstand its will and desires. This dog would be very intolerant to others. Gun Dogs, Whippets and those dogs that belong to the sort of hunters would have the strongest will and character. 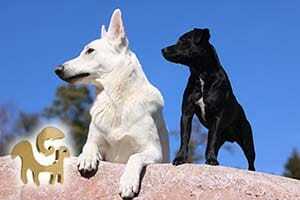 Leo- and Sagittarius-individualities have the best chances to become good friends with Aries dog. These signs are stable and patient and can slightly deal with great energies of this dog. They are energetic as well. All humans and dogs that are born under these signs show a natural and strong connection. Therefore, they can live side by side and have almost no misunderstandings. Less stable personalities would find it difficult to find peace and harmony with this energetic and independent pet.